Call PETA: Microsoft doing animal research!!!! 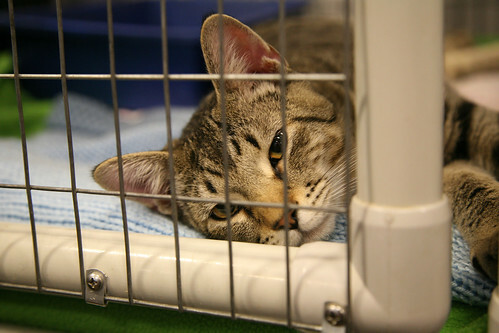 OMG, Microsoft is keeping cats in cages and doing experiments on them! I always knew they were evil but this is beyond the pale! Turns out this is really something much more innocuous and rather cool: the “Assira”:http://research.microsoft.com/asirra/ CAPTCHA solution. Not only is it a clever idea, but it actually helps find homes for pets via a partnership with “petfinder.com”:http://www.petfinder.com/. Nicely done! ~ by Andrew Shebanow on 07Mar07. uhm, you may not want to call PETA when you see animals in cages… a news search on the name “Adria Hinkle” starts to untease the story on what happened to over 14,000 strays after PETA said they’d find them homes. [Andrew says] I was kidding about the whole PETA thing. I’m not a fan of them or any other organization that takes extreme positions.